Applications are invited from qualified candidates for admission into 5- year and 4- year Part-Time Degree Bachelor’s Degree Programmes. Admission forms are available at a cost of Ten thousand Naira (N10,000) only. 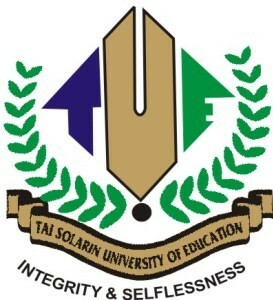 NB: Only the www.tasued.edu.ng. has the legitimate and authentic platform for the Part-Time application form. (ii) Click Part-Time application form. www.tasued.edu.ng (iii) Complete the Part-Time application form by providing the required information. (iv) Submit your form by clicking submit button. (v) Print out an identification slip containing your colour passport photograph. The printed slip will serve as candidate’s identification/admission card for the screening test. Screening shall be conducted on Friday, 25th August, 2017 for all 100 level and Direct Entry (200 level) applicants at ICT Ososa Campus of the University by 9.00 a.m.
Candidates’ participation in the screening exercise is a mandatory requirement for entry into the University. The results of the screening exercise should be checked on the University Website a week after the screening.